Jon Johnson joined the Elmont Cardinals Football Club family in 2003 and has had a front row seat to the club's recent story. When Elmont Online talked with Johnson it was clear that he, as current president of the club, was focused on giving the community’s youth after school team sports options that promote the physical, academic and social well-being of young people and the families that are Cardinals. “One of our goals is to produce more scholar-athletes” said Johnson. Johnson has been the club’s president since 2005 and has steered the club, with the help of an all volunteer board, through its various ups and downs. “More ups, thank god” said Johnson. The club, formed in 1967 as a football club, has a long history of community involvement and represents one of the well established pillars of the community. After 46 years the club points to numerous football players that have gone on to flourish at Elmont Memorial High School, Sewanhaka High School, Floral Park High School and many other area schools and clubs. 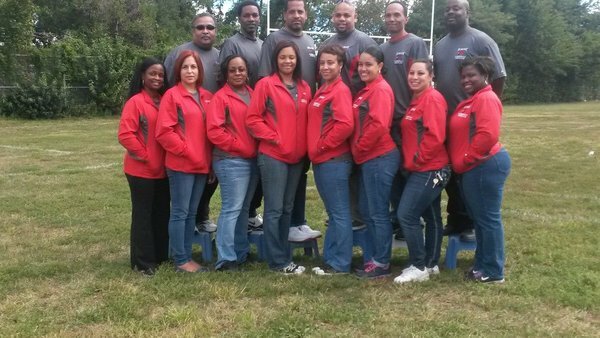 Elmont Cardinals players continue to be the source of athletic success for many area schools. In fact it is difficult to attend an area sporting event today without bumping into an Elmont Cardinal participating as athlete and /or volunteer. “There are many more examples” says Johnson and he is right. “Some of the accolades garnered by our Cardinals teams and individual members in football are on display at the Dutch Broadway Sports Complex”. In addition, the mantles and bookshelves of many homes throughout the community are adorned with trophies, plaques and medals earned by Cardinals children, parents and coaches. The Elmont Cardinals is hosting its 46thAnnual Award Ceremony on February 1st at Antuns.